I think it was about time to make something from this. The material from MGR:R was always a feast for my eyes considering the high visual quality and the cybernetic look. The game itself, other than the sometimes problematic camera angles, the bland story background and the hillarious voice acting, it was more than satisfying and fulfilling by all aspects. Maybe I should write a more detailed review but moving to the wall itself it didn't take more than 10 minutes to put everything into place. The scans were cut carefuly in order to blend together. Rest was mostly experimenting with depth and enhancing the image quality. Furthermore, it consisted of using different levels of Gaussian Blur in multiple copies and erasing the parts that had to be sharper. 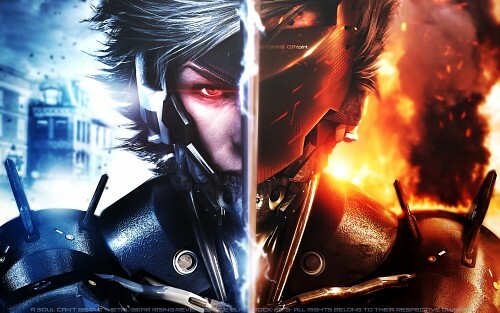 I wanted to center most of attention on the figure of Raiden hence he is the one who is somehow sharper than the rest. However, I was uncertain about the sword but after some thought on it and imagining how would the human eye perceive Raiden on that pose I have decided to blur it as well. The final touches were a red and blue linear gradient, a white and black radial gradient,noise fixing and level adjustment. Now that is an wallpaper badass enough from Revengeance, thanks man, desktop right now. Loved the Artist's Comment. Made me LOL. So you just basically stuck two images together.... but despite how simple that is, the wally turned out pretty good. I can't argue with duh on that comment, you did a fantastic job of merging two pictures together and making a new one. I'm pretty certain even Raiden himself would approve ! outstanding job, love the crisp dark details to the piece. The wall is good. However, it has been only a copy and paste job and contrast basic retouching. The big mistake I see are the text that appear in the hull of the right image and you have not deleted. Dying because of the awesomeness of this pic.